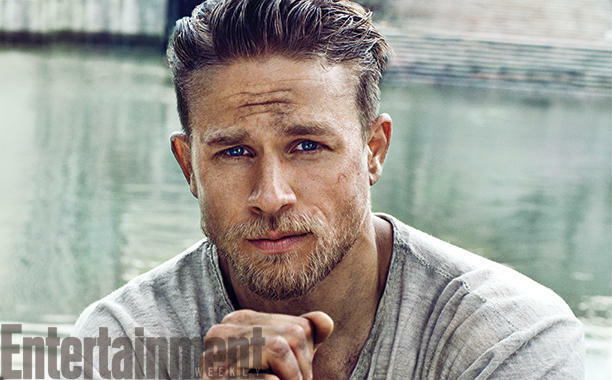 EW has released the cover for their upcoming issue, which features our first official look at Charlie Hunnam as the title monarch in Knights of the Round Table: King Arthur. Check it out below along with some additional images of Hunnam in costume! EW also reports that the film will dive head first into the fantasy elements, most notably with the use of giant snakes, massive war elephants, and a “monstrous viking-like creature” called The Nemesis. Ambitiously planned to potentially span six films, Knights of the Round Table: King Arthur will offer a re-imagining of Arthurian legend. Believed to have been a 6th century King, Arthur defended Britain against Saxon invaders. The key source material for the film will be Thomas Mallory’s “Le Morte d’Arthur,” published in 1485 as a compilation of French and English tales. Knights of the Round Table: King Arthur also stars Astrid Berges-Frisbey (Pirates of the Caribbean: On Stranger Tides), Jude Law (Spy, Sherlock Holmes), Eric Bana, and Djimon Honsou. Scheduled for a July 22, 2016 release, King Arthur was written by Joby Harold, who is producing with Akiva Goldsman, Tory Tunnell and Ritchie himself. Cate Adams and Niija Kuykendall are overseeing for Warner Bros. Pictures and Village Roadshow. It’s release date will see the film opening opposite both Paul Feig’s Ghostbusters reboot.